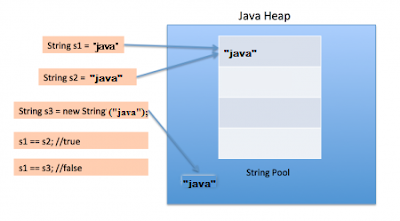 String is probably the most commonly used class in java library. String class is encapsulated under java.lang package. 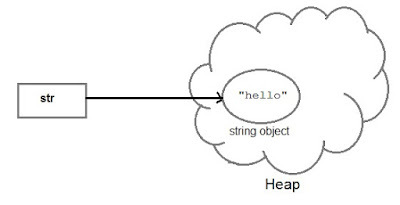 In java, every string that you create is actually an object of type String. One important thing to notice about string object is that string objects are immutable that means once a string object is created it cannot be altered. What is an Immutable object? An object whose state cannot be changed after it is created is known as an Immutable object. String, Integer, Byte, Short, Float, Double and all other wrapper classes objects are immutable. In this example MyString is an immutable class. MyString's state cannot be changed once it is created. 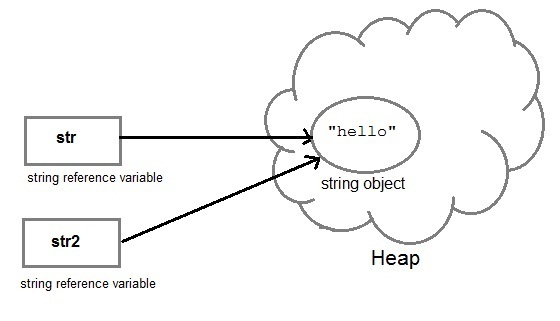 String can be created in number of ways, here are a few ways of creating string object. 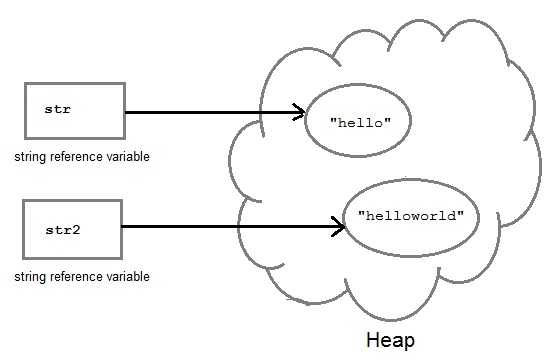 String literal is a simple string enclosed in double quotes " ". A string literal is treated as a String object. Each time you create a String literal, the JVM checks the string pool first. If the string literal already exists in the pool, a reference to the pool instance is returned. If string does not exist in the pool, a new string object is created, and is placed in the pool. String objects are stored in a special memory area known as string constant pool inside the heap memory. When we create a new string object using string literal, that string literal is added to the string pool, if it is not present there already. And, when we create another object with same string, then a reference of the string literal already present in string pool is returned. But if we change the new string, its reference gets modified. There are 2 methods to concatenate two or more string. 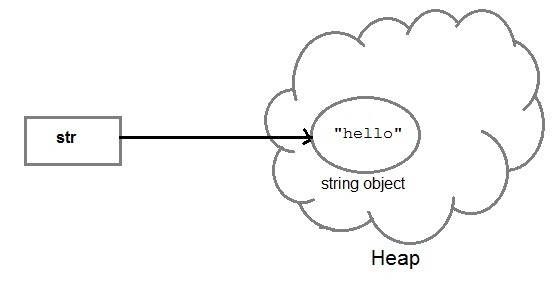 String str1 = "Hello".concat("Java");    //works with string literals too. String comparison can be done in 3 ways. It compares the content of the strings. It will return true if string matches, else returns false. == operator compares two object references to check whether they refer to same instance. This also, will return true on successful match. Its because we are creating a new object using new operator, and thus it gets created in a non-pool memory area of the heap. s1 is pointing to the String in string pool while s3 is pointing to the String in heap and hence, when we compare s1 and s3, the answer is false.